The Old Stables at Barnacre Cottages in Scorton, near Garstang sleeps 13 people. Barnacre Cottages near Garstang are located in the heart of Lancashire’s beautiful countryside; Barnacre Cottages were the first self-catering cottages in Lancashire to be awarded Visit England’s 5 Star Gold Award, and have since gone on to achieve many other regional and national awards. 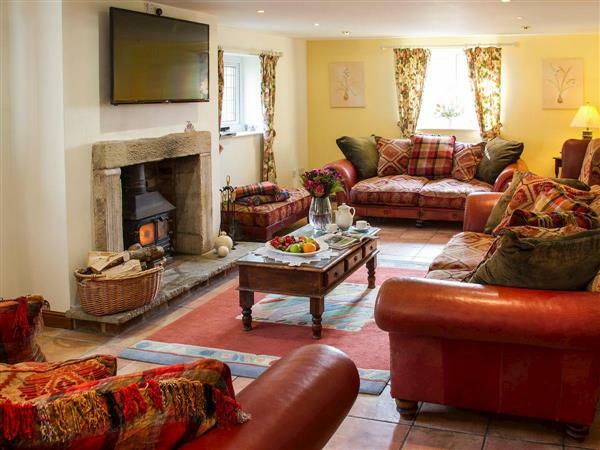 They have been created from old stone buildings of an 18th-century farmhouse that had lain empty and neglected for many years, and have now been converted by the owners into beautiful holiday cottages. Situated at the top of the field, Mole End (ref 31222 [Mole End]) is a spacious, detached, stone-built holiday cottage with spectacular views over the surrounding Lancashire countryside. 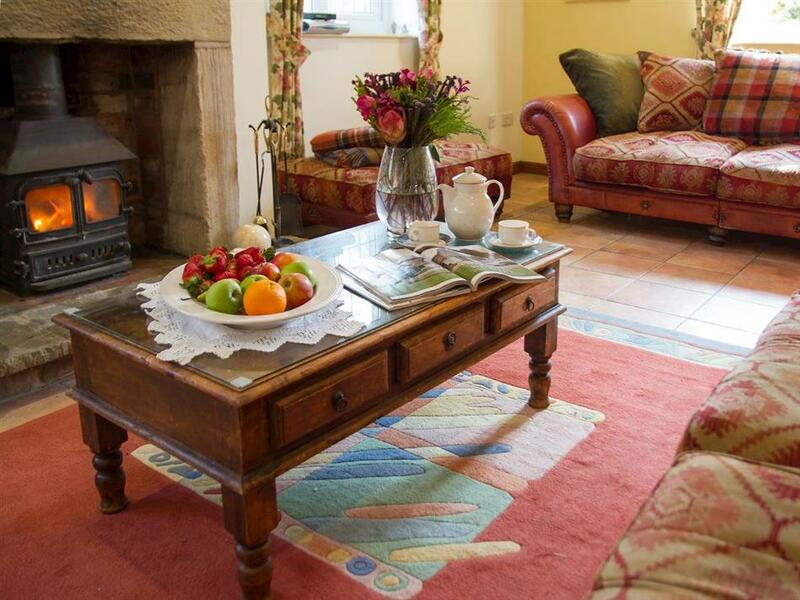 With accommodation for seven guests, it is ideal for small groups or families. Sleeping six, Partridge Cottage (ref 31221 [Partridge Cottage]) is a mid-terraced cottage offering attractively presented and comfortable accommodation, ideal for families and couples. The Old Stables (ref UKC765), ideal for family reunions or groups of friends, sleeps thirteen; it has a beautiful designer oak kitchen with Belfast sink and Aga. The Piggeries (ref UKC766 [The Piggeries]), beautifully transformed and extended, offers stunning, detached accommodation for nine guests and has a dining room with a glass roof as well as a Juliet balcony in two of the bedrooms. Largest of the properties, sleeping fifteen, is Woodpecker Cottage (ref UKC764 [Woodpecker Cottage]), which has plenty of entertaining space both inside and out; it has six bedrooms, five of which are en-suite. Barnacre Cottages near Garstang can be booked together to accommodate larger parties. Living area: With wood burner, 48 Freesat TV, DVD player and CD player. Kitchen area: With breakfast area, oil Aga, gas oven, microwave, American-style fridge/freezer, dishwasher, washing machine, washer/dryer and Belfast sink. Bedroom 1: With double bed, tiled floor and French doors leading to paved garden. Bedroom 6: With twin beds and Velux window. Oil central heating, gas, oil and logs for wood burner included. Enclosed lawned garden with patio and garden furniture. Private parking for 3 cars; additional on-site parking. All properties: Electricity, bed linen, towels and Wi-Fi included. Travel cot and highchair available on request. Shared 12-acre grounds. Shared tennis court. Shared children’s play area. No smoking. Holidays at The Old Stables, Barnacre Cottages run from Friday to Friday. For a better idea of where Barnacre Cottages - The Old Stables is, you can see Barnacre Cottages - The Old Stables on the map below. Barnacre Cottages - The Old Stables is in Lancashire; should you be on the lookout for a special offer, you can find all the special offers in Lancashire. It's always worth checking to see what is on offer at the moment. Do you want to holiday near Barnacre Cottages - The Old Stables (UKC765), you can see other cottages within 25 miles of Barnacre Cottages - The Old Stables; have a look to find your perfect holiday location.